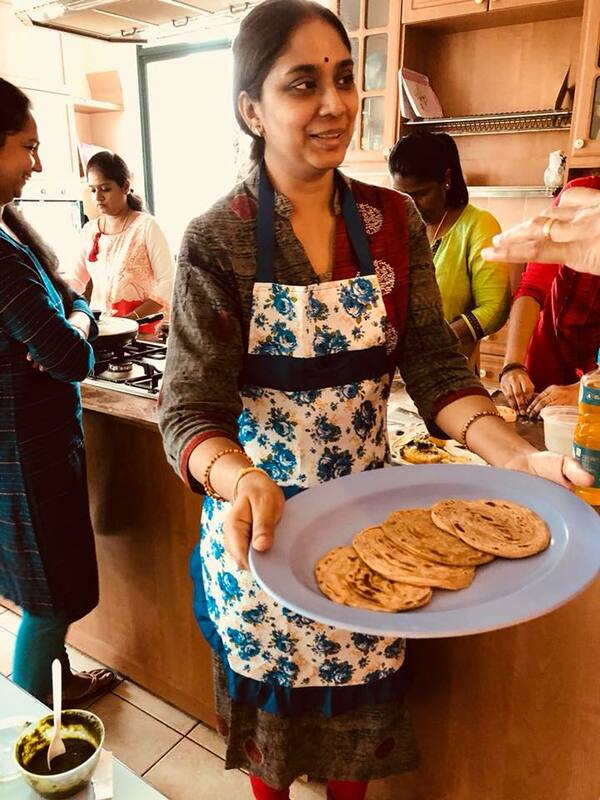 Recipe for Lachha Paratha type 1. Take required whole wheat flour, oil, salt and mix to a dough with water. Now divide the dough into equal parts. Spread on rolling pin like chapathi as thin as possible. Spread oil and little flour and start folding like paper fan. Then roll and slowly spread in hand to make paratha. Don’t press too much. If using rolling pin press lightly so the lachha don’t go or mix up. Cook on a tawa both side using little oil or ghee. Lachha Paratha is ready. I served it with paneer pasanda. Will share recipe soon. Serve with any gravy and relish hot. For gravy recipes click here. PS - Your feedback is appreciated. Do try recipe from (http://www.sarascorner.net/) take a picture and send it to me through Facebook message or mail me at simplysara07@gmail.com. Will be glad to add in my page Tried & Tasted album on FB or post on my page. Do follow me on Instagram id - saraswathiyer for more food stories and recipe ideas.Thank you. Palak or any greens you can add. Can add Mint/pudina leaves also. - Wash coriander, curry leaves, green chilli, ginger. - Grind all to fine paste. - Leave it for 1 hour at room temperature. - You can also make it immediately if you want. 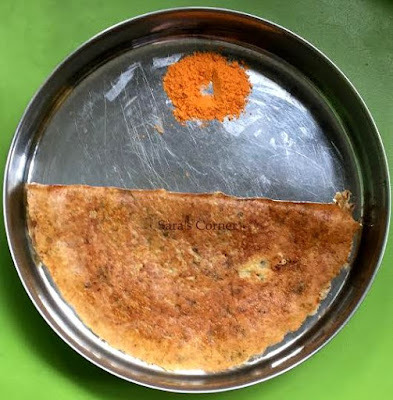 - Heat a tawa/skillet, spread like dosa and cook both sides. - Add onions immediately once you spread dosa. Add 1 tspn oil(optional) if non stick no need to add. - Enjoy the green healthy dosa with Molagapodi, spicy chutney or sambar. - For soaking fast, you can also soak in hot water and reduce timing. Facebook message or mail me at simplysara07@gmail.com. Will be glad to add in my page Tried & Tasted album on FB or post on my page. Do follow me on Instagram id - saraswathiyer for more food stories and recipe ideas.Thank you. 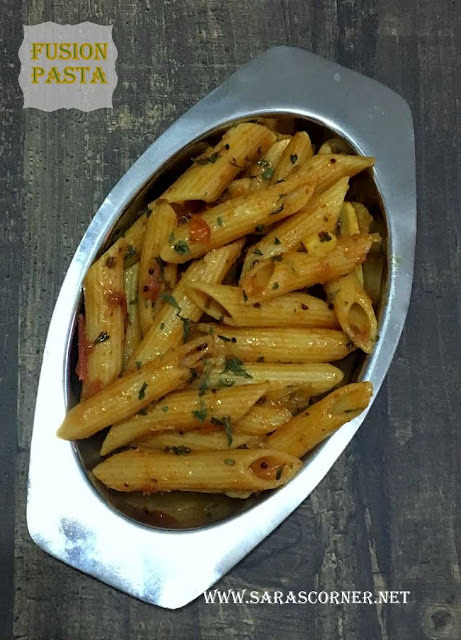 Onion Tomato Gojju Pasta | Indian style! I had posted here on instagram poll. Many had asked the recipe for the pasta. Here is the simple recipe for the same. I hope you enjoy. 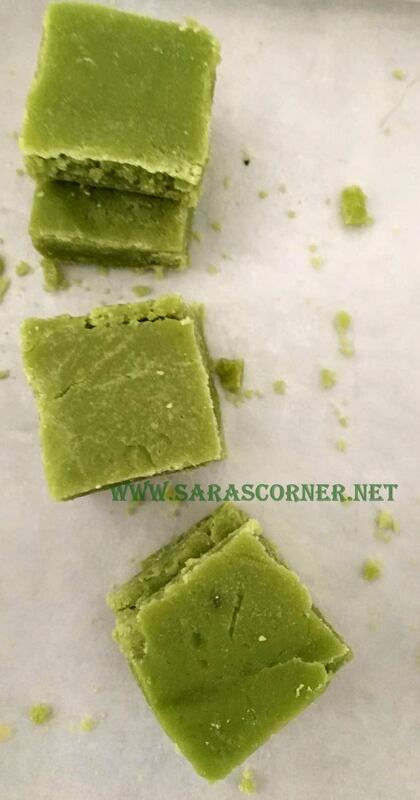 My kids and family liked it a lot and I prepared 2 times in a week. 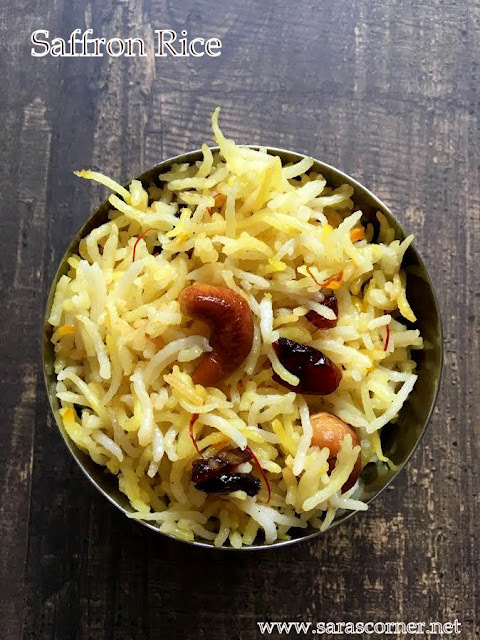 Do follow me on Instagram id - saraswathiyer for more food stories and recipe ideas. any shape pasta - 2 big bowls or 4-6 handfull. First, in a heavy bottom kadai, add oil, mustard seeds and fenugreek seeds. once it splutters add onion, garlic and saute till pink. Add salt, masala powders and cook till it becomes soft and mushy. Add little water and cook to saucy stage. Now the gojju is ready. Add cooked pasta and mix well. I have not used cheese for this pasta. You can top it with cheese. 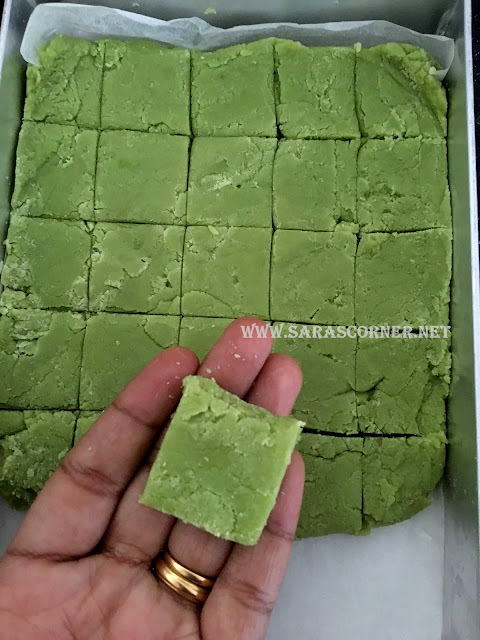 Maida Burfi/Maida cake is very simple and easy sweet. I prepared this for this Deepavali, it was delicious. I just referred the video from Chitra on my instafeed. On 12th November, I did a cooking demo here in Pasir Ris East CC checkout the post here and here for what I prepared for a group of lovely ladies. Thanks to my kids and hubby for their support always. Do follow me on instagram id saraswathiyer for all the insta stories and my travelling stories. 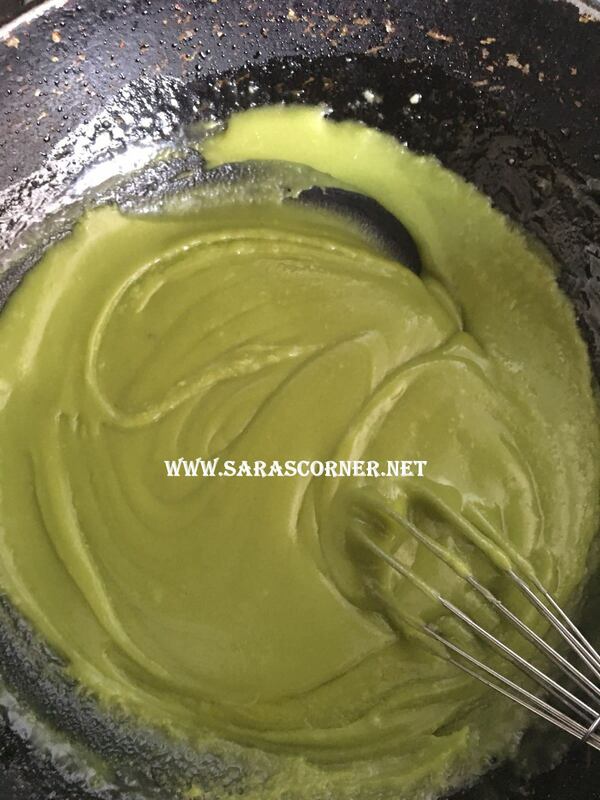 · Heat a pan add ghee, once its melts add maida and sauté well for 5-8 mins till it combines and you will notice slight colour change. It will look like crumble. · In another kadai or pan add sugar n water make 1 string consistency n off the stove. · Add elachi powder food colour and mix well. · Add maida ghee mix n mix fully to get a mass. 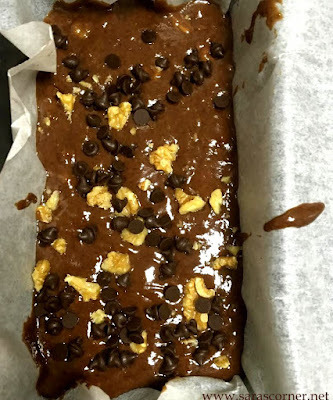 · Transfer to greased plate and spread neatly. · Cut when warm to desired shape. Allow to cool completely and store in air tight container. Planning for Navaratri | Prasadham | Neivedyam Post! Once festival season begins in July, biggest festival is Navaratri which we celebrate for 9 days between september and October. To celebrate the festival as easier way, planning ahead and executing plays a major role here. We love to clean and decorate the house, take out all the dolls and set up neatly. Arranging can be from simple to grand depends upon once convenience. If kids are small its difficult to do everything, so can keep it simple. Many don't have house help here, some ladies do everything alone and takes lots of interest involved in it and months of preparations goes in. Themes are thought and each year some do different theme. We need to prepare almost a month before for doing art work if we are doing at home. They need time to dry, repaint, etc. When I was in India, the affair was very grand, my in laws and sister in laws house they keep a lot of dolls, the set up will be almost 3/4th the big hall. But unlike here, I keep it simple. 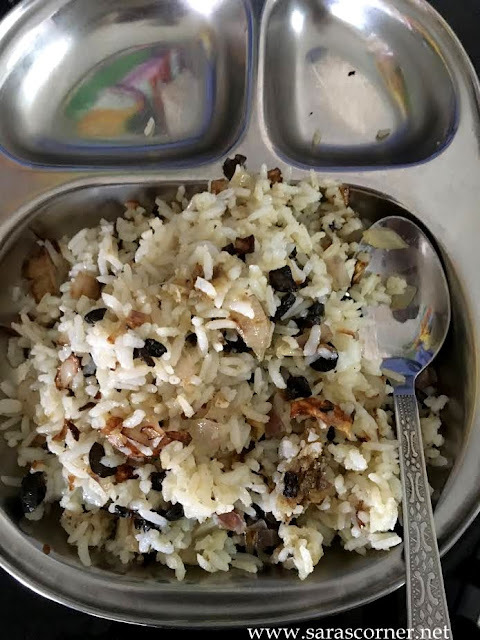 In India only sundal will be served with vethalai paaku as we will be visiting the whole neighbourhood around 50-60 houses, but in singapore we visit around 8-10 houses and they serve food to all ladies who come, some will come from quiet far. Here each day they visit one friends home all are called together. So everyone visits friends place and spend time. Here life is mechanical for some, in the festival season one can visit friends and have a divine darshan, chat and enjoy food. Now coming to food part, planning. 1. List number of people you will be inviting. 2. Plan a menu, I will be giving down my menu suggestions below. 4. Buy gifts, checkout options for ladies and kids. If you are going or while coming from India pickup few items also some extra. 6. Taking out dolls and wipe it. Menu for festivals you can check here. All menu please prepare without onion and garlic. Wish you all Happy Navaratri! Besan Poha Laddo | Krishnajayanthi recipes! Maaladu/Besan poha laddu is a slight twist for regular maaladu/besan laddu. My kids love maaladu a lot, I added aval and prepared for this krishnajayanthi and they liked it. 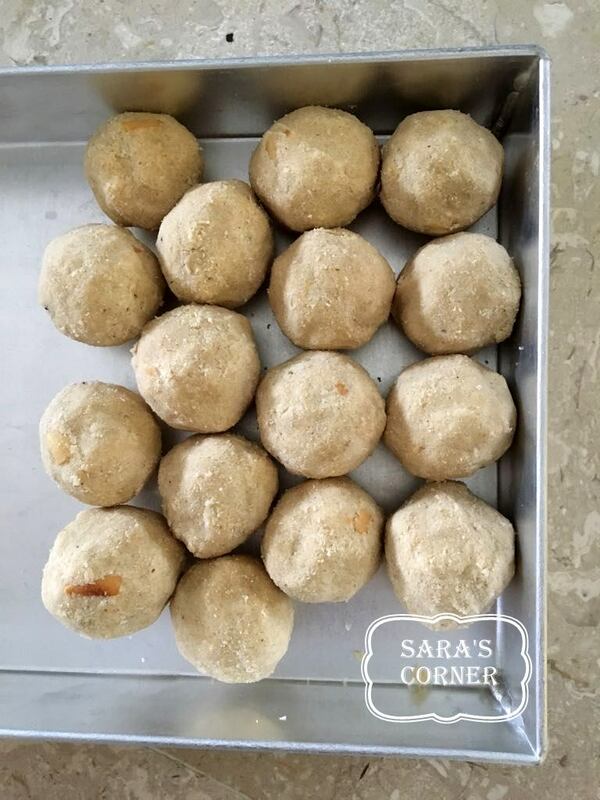 Checkout my Maladoo/Besan ladoo recipe here. Heat a kadai/wok, add aval and dry roast it for 5 mins. Then transfer it to a plate. Add pottukadalai and dry roast till you get good aroma. Tranfer it to plate. Add pottukadalai to mixie and pulse to fine powder. Add the aval/poha powder and grind together again to fine powder. Transfer to a bowl. Add sugar, cardamom in mixie and make a fine powder. Transfer to bowl and mix all well. Heat the ghee and add cashews. Once its brown off it, add to the powder and mix well and start making lemon size balls. Laddoo is ready to serve. PS - Your feedback is appreciated. Do try recipe from (http://www.sarascorner.net/) take a picture and send it to me through Facebook message or mail me at simplysara07@gmail.com. Will be glad to add in my page Tried & Tasted album on FB or post on my page. Thank you. 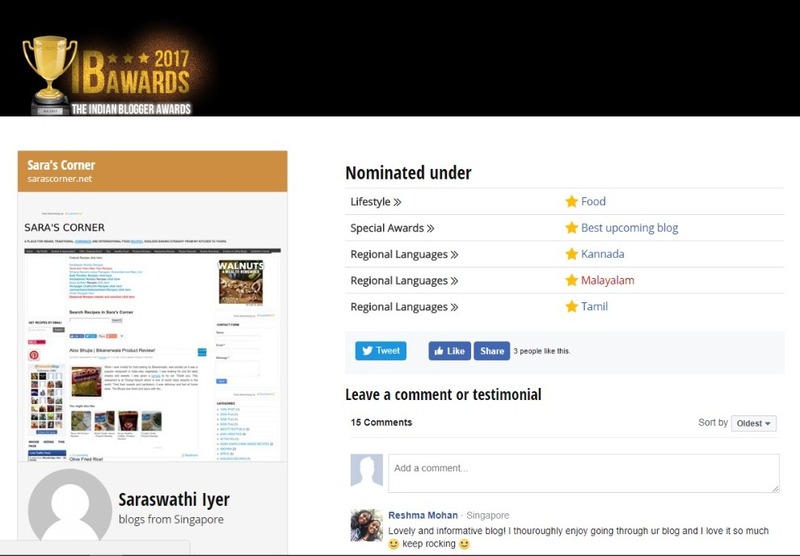 My blog Sara's Corner has been nominated for The 2017 Indian Blogger Awards! I'd really appreciate it if you could visit my nomination page and leave a comment about my blog on the link below and leave your feedback for me to win. Looking forward for your support and love. An easy and quick chaat on weekends or for party can be put together in few minutes. Enjoy the tasty Papad Chaat. Mashed Potato/peanuts/cucumber - optional if you have ready can add. At the time of serving start filling and keep ready otherwise it will be soggy. I have made a batch with tomatoes. Papad Chaat is ready to serve. Also checkout some of the chaat recipes here. Notes : You can use any papad here. Aloo Bhujia | Bikanerwala Product Review! When I was invited for food tasting by Bikanerwala, was excited as it was a popular restaurant in India also vegetarian. I was looking for one for tasty snacks and sweets. I was given a sample to try out. Thank you. This restuarant is at Changi Airport which is one of world class airports in the world. Tried their sweets and namkeens, it was delicious and feel at home taste. The Bhujia was fresh and spicy with the hint of mint.😀 Its one of the popular brand in India now in Singapore. Sweets are very fresh especially Kajukatli was delicious. They are specialised in Bengali sweets. My kids loved the sweets and savories. You should try their matris, samosas and biscuits. Also goes perfectly with coffee and tea. Their cookies and biscuits are so tasty and an ideal for snackbox for kids. Do try and get the goodies they are in Terminal 3, . 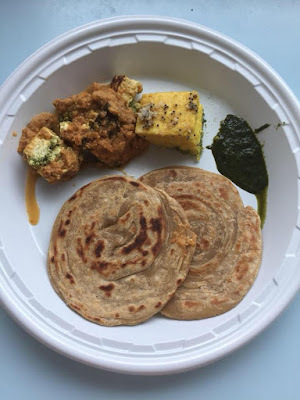 Kids loved the taste and I made it a bit Indian style and it was a hit. Check this simple recipe and do try. Take 10 olives, garlic,green chilli and grind to fine paste. Heat a kadai, add olive oil, add chopped onion and saute till light brownish. Keep stove on high flame. Add the olive paste and saute. Add rest 10 olives chopped or sliced, saute for few mins. Add salt, sugar and mix. Keep flame high and fry for 2 mins and switch off the stove. Here I have skipped sauces you can add soya or any sauce preferred. Olive fried rice is ready to serve. Onion Tomato Gojju is a simple and delicious sidedish for rice or chapathi. Do follow me on instagram for my instastories. Heat a kadai, add oil, mustard, once its splutters, add onion and a pinch of salt. let onion fry till transparant. Now add turmeric, salt, red chilli powder and sambar powder. Add a tblpn of oil and simmer it. Add jaggery/sugar and mix well. Let it cook for 5 mins and its ready. Serve with Chapathi, Dosai, Idli or can make tomato rice. 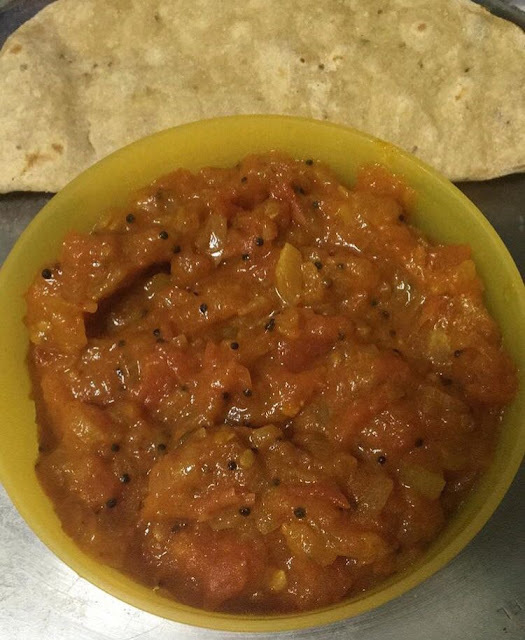 checkout my tomato thokku post here (without onion/multipurpose thokku). This can be kept for lunch box by spreading on chapathi or on travel and its really very delicious. You can add grated paneer too. PS - Your feedback is appreciated. Do try recipe from (http://www.sarascorner.net/) take picture and send it to me through Facebook message or mail me at simplysara07@gmail.com. Will be glad to add in my page Tried & Tasted album on FB or post on my page. Thank you. When my younger one was asking for a cake, I baked this chocolate cake. It was polished off on the same day. My cake looks like brownie too. So I have named it as Eggless Chocolate Walnut Brownie Cake ! Seive flour, soda, baking powder, cocoa powder. Take the banana and make it to a paste in mixie. In another bowl add banana paste, sugar, vinegar, oil and mix well. you can use hand mixer or whisk. Slowly add the flour mix and mix slowly in one direction. 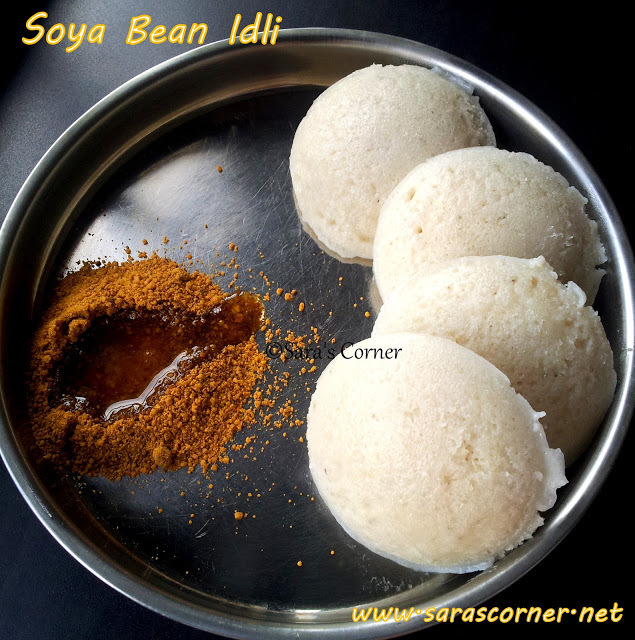 You will get a dough form, now add milk to get consistency as idli batter not very runny. Add chopped walnuts. If you feel sugar is less then add chocochips, if not can bake just like that. Take a baking tin grease it or can put parchment paper. Pour in the batter tap it twice. Garnish with little walnut and chocochip. Bake it for 40mins. Check with a fork/toothpick when it comes clean or bake it for 5 to 10 mins more. Cool it and slice. You can also do icing if you wish. It is good for school snack or coffee time. 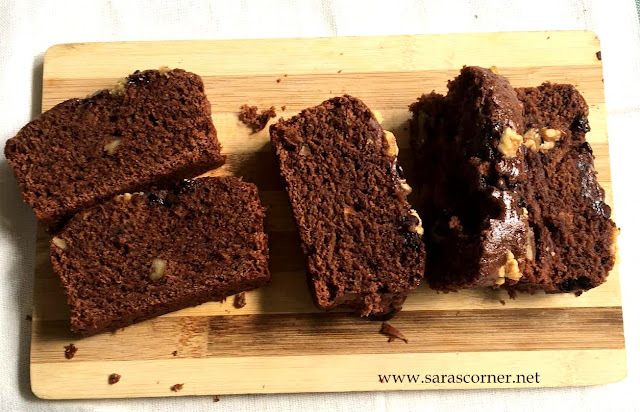 Enjoy the Eggless Chocolate Walnut Brownie Cake ! You can just do with banana and walnut. You can also skip banana do with chocolate and walnut. 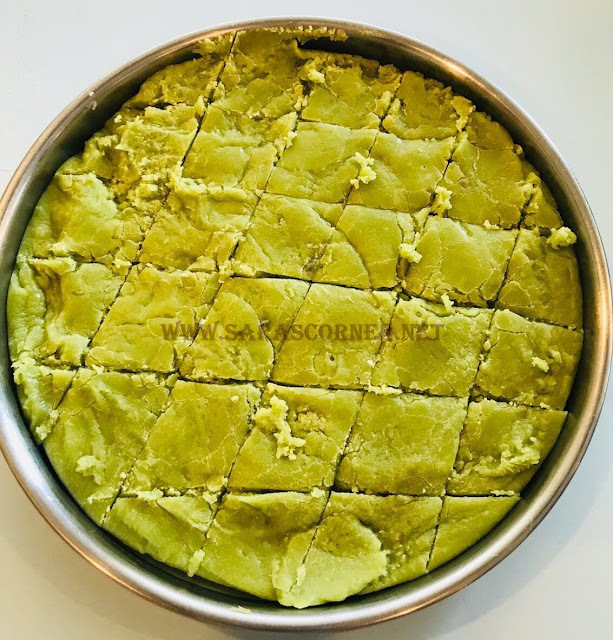 Varagu Adai is really healthy and great to substitute rice with millets. 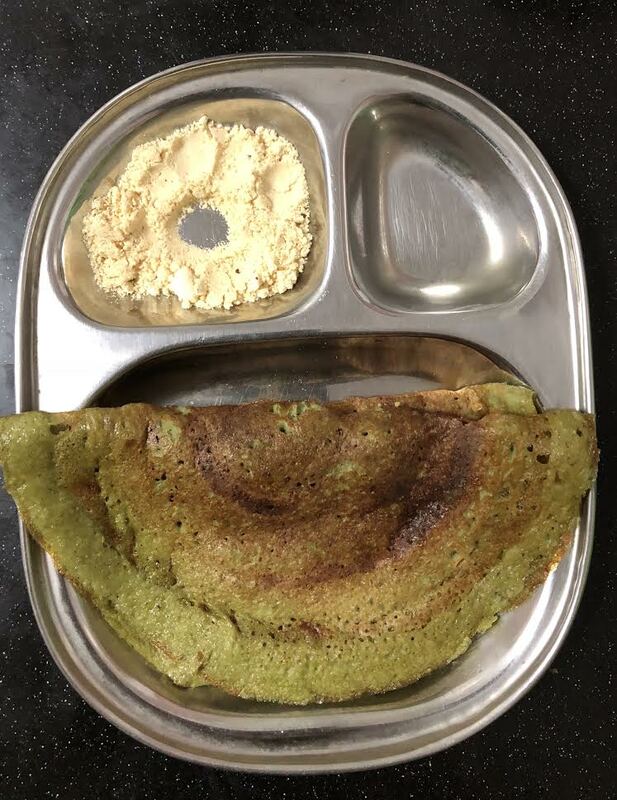 I have been trying to include millets in my cooking mostly in my breakfast and tiffin. This was very tasty and delicious. Do try and enjoy. Wash, rinse and soak all ingredients except salt for 2-3 hrs. Then grind with salt to coarse batter with water. Heat a skillet/tawa and can prepare adai like dosas immediately or can rest the batter for 1/2-1 hour and make too. Drizzle some gingely oil and cook both sides until crispy. 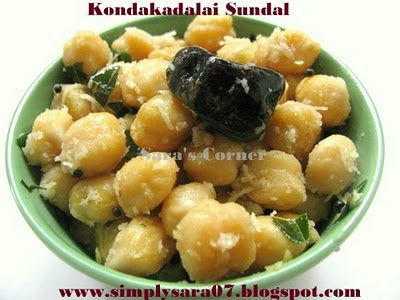 Serve with any of them chutney /molagai podi / Aviyal/Jaggery/Curd. You can grind all the ingredients to coarse/fine powder store it and prepare dosa by just adding water anytime.